The Thiên Mụ Pagoda (which means Heavenly Lady) is on a hill next to the Perfume River and is a symbol of the city of Hue. Legend has it that in 1601 a mystic predicted that whoever found a pagoda on the promontory along the Perfume River would usher in a great dynasty. Nguyen Hoang, governor of the province of Thuan Hoa, followed the directions and the mystic's prediction was confirmed. The Nguyen Dynasty and its lineage, was the last of the imperial dynasties to rule Vietnam and lasted until 1945. 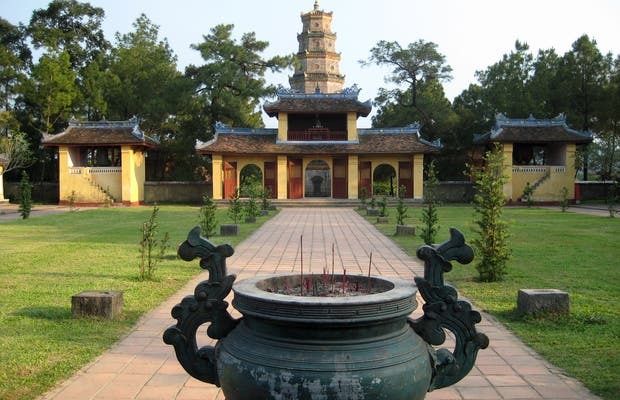 The Thiên Mụ Pagoda is located on the banks of the Perfume River and is a Vietnamese icon. Ever since the 60’s, it has been a popular place for political protests. The Austin car which brought the monk Thich Quang Duc to his famous place of self-immolation in 1963 is housed here. The image of his protest of the Vietnamese president made headlines throughout the world. It’s worth spending an entire afternoon there absorbing the peace and quiet and watching the monks walk through the gardens and their novices (the boys in blue robes and the girls in brown, all with shaved heads) play around. You can visit this monastery where they currently still train young novices to become monks. The interior holds the car which took Thich Quang Duc (the first monk to self-immolate in protest of the South Vietnamese government) to Saigon.